These two pony tail with braid styles should be a recipe for glam hair -- though it may take you a few tries to get it right! Combining a ponytail with a braid is like mixing cookie batter with brownie mix. Two classics that are great on their own, when added together have the potential to make for a great combination…or the potential to be a little too much. We’ve rounded up three styles combining a ponytail with braid that we think will come out just right. 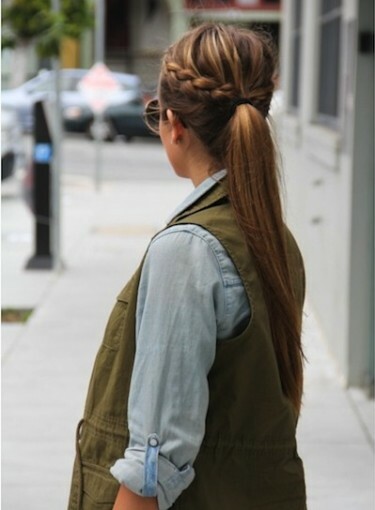 Braids have a subtle way of making any hairstyle seem free-spirited. Start this flower-child look by braiding a small piece of hair near the front of your head. This piece will be tucked back into your ponytail, so make sure you braid it towards the back of your head. Use a texturizer or dry shampoo on the crown of your head to add volume and create a messy look. Pull all of your hair into a low ponytail between the crown of your head and the nape of your neck, leaving your part intact. This look will work best if you add curl to your ponytail, so use a curling iron to give yourself some body. Pull out some wisps around your face in the front for a romantic touch. If you’re looking for more romantic hairstyles, try the looks from Best Date Night Hairstyles. This style does require some finesse, so if you’re still practicing your French braid, you might want to bookmark this one for later, but if you’re ready for a challenge, start your finger stretches! Begin this style with a side part. Start a small French braid right at your part that wraps around like a headband. When you reach the bottom side of the rest of your hair, tie it off in a ponytail. Add some curl to your ponytail with a large barrel curling iron. P.S. — If you can’t quite continue the French braid around the back of your head, end it around the bottom of your ear. For more pony tail with braid styles, check out the 10 Best Braided Hairstyles.